One Tuesday afternoon, Luis Severino was named the starter for the American League Wild Card Game, getting the nod from Yankees Manager Aaron Boone a day ahead of the one-game playoff with the Oakland A's. Boone went with Severino, who went 19-8 with a 3.39 ERA this season, but had a tough second half, as well as the fact that he got knocked out in the first inning of last year's Wild Card Game. Nobody would have been surprised to see Boone turn to J.A. Happ, who had a phenomenal two months since coming to the Yankees in late July, and Masahiro Tanaka, who was money in last year's playoffs. Severino rewarded Boone's faith with a strong outing, as he threw four shutout innings, allowing us two hits and four walks, with seven strikeouts. In the fifth inning after allowing a pair of hits, the only ones he allowed all night, Severino was pulled and he left the field to a standing ovation. At 24 years old, 225 days, Severino is the second-youngest Yankees pitcher with at least seven strikeouts in a scoreless postseason start, behind 22-year-old Dave Righetti, who had 10 strikeouts in six innings in 1981 in Game 2 of the ALDS against Milwaukee. In Severino's first time through the Oakland order, he allowed just one ball in play, as he racked up six strikeouts, allowed two walks, and got a groundout. In the fourth, Oakland loaded the bases and Severino got out of it by striking out Trevor Semien on a 1-2 fastball that Statcast clocked at 99.6 MPH, his hardest thrown pitch of the night. How would you describe the atmosphere and the electricity on the mound in that first inning? LUIS SEVERINO: It was amazing. Electric. I don't know how to say it in words. When I stepped to the mound, every time I had two strikes, a guy was like -- they were going (indiscernible). It was so thrilling. Q. What was working for you tonight and what wasn't working and what was it like working with Gary behind the plate? LUIS SEVERINO: They got two big (indiscernible) in the last inning. I think everything was working. (Indiscernible). The changeup, the communication between Gary and I was amazing out there to have (indiscernible) that game and fix and everything is working better after that. Q. What was the feeling like when you struck out Semien with the bases loaded? LUIS SEVERINO: I would say satisfaction. Big inning, bases can get a tie game or even worse. So it was really big. Q. How did you get into the pattern of all fastballs in the first inning and then go heavy slider after that? You started off I guess nine of your ten pitches were fastballs in the first and then a lot more sliders after that. What was the thinking? LUIS SEVERINO: I mean, I think that the time was, you know, I think that they were looking with two strikes for the slider. So the attack was the fastball ball, if they chase it or hit it hard, I go to my second pitches. The first inning it was that mindset. Attack it and then figure it out. Q. Could you describe your feeling as you're watching Dellin get out of that jam in the fifth? LUIS SEVERINO: It was great. Dellin, he's nasty. I got two runners on base. You know, strikeout. A fly ball. It was amazing. Q. You were 10 years old the last time the Yankees and Red Sox played in the playoffs. Did you watch that series in '04 or '03, watching Pedro maybe or Ortiz? LUIS SEVERINO: I think at that time I didn't even have even TV. I'm not even sure. But I think I've been shown the highlights. It will be fun. Really fun. Q. It's been a struggle to get this team healthy. For Judge to be out there in the first inning, hit the home run like that, how big do you think it was moving forward to have that going? LUIS SEVERINO: Judge has been consistent with last year and the playoffs. So it's not a surprise. It's not a surprise for our team like that we do -- he's been great since he got here. So it's not surprising. It's big, that home run, that inning, for me and for the team. When you've got two runs and a score like that, you go out there and you feel more calm. Q. Did they give you the sense going into the game that even if you were pretty good, it might only be four, five, six innings not as long of an outing as a regular season outing, and if they did, did that -- does it contribute to how much you were able to put into it in the first inning? You almost came out almost like a reliever in the first in terms of the adrenalin, the fastball? LUIS SEVERINO: I think that was the plan, go four or five good innings and after that the bullpen is going to go do their job. And when I went into the first inning that was the mindset. I went there and get my job done. Q. The team's got a nice win streak going here in the postseason now. How much of an advantage is it playing here at Yankee Stadium? LUIS SEVERINO: I don't know what it is about this place here, but every time we are here, you know everything is good, you know. You feel no pressure. You feel like you're home. And when you go on the mound or the batter goes to the plate, it's pitching (indiscernible) a strikeout or a homer. Q. Did you think at all about last year's Wild Card game leading up to this game and things you wanted to do differently? LUIS SEVERINO: I did think about it. I'm a guy like I like to look at the struggles that I have in the past so I can fix it. I knew when I went to this game that it's going to be different. And that's why the first inning I went after everybody. I wasn't trying to be too perfect. I was trying to (indiscernible). Q. Piggybacking off that question, given that, and kind of how the second half went for you, how satisfying was it to perform like you did tonight? 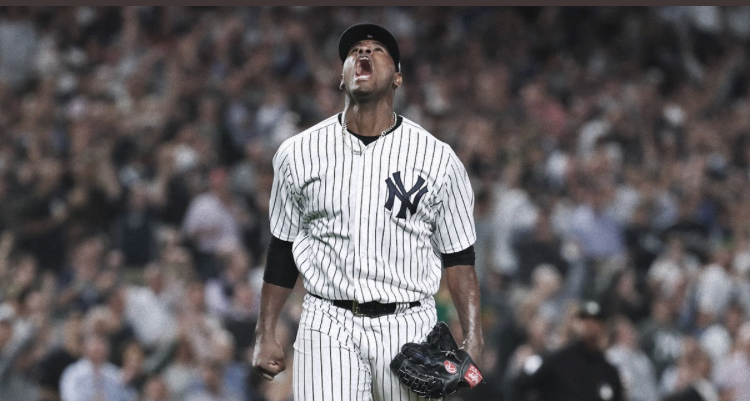 LUIS SEVERINO: Amazing. Like I said, you know, after what happened last year, I think the first inning was huge for me. After all the stuff that people say or social media, all of that stuff, it's a great day to, a game like this and go four good innings.